Arnold Lignitz was born on 25 March 1913 at Insterburg in Ostpreußen. At the outbreak of World War 2, Lignitz was serving with 3./JG 20. 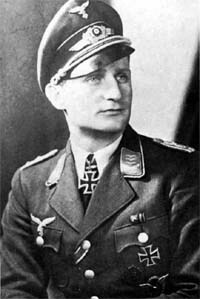 He was appointed Staffelkapitän of 3./JG 20 on 16 January 1940, leading the unit during the French campaign. Lignitz recorded his first victory on 14 April when he shot down a RAF Blenheim twin-engine bomber. On 31 May, he shot down three RAF Spitfire fighters near Dunkirk to record his second through fourth victories. Lignitz led 9./JG 51, as 3./JG 20 had been redesignated on 4 July 1940, during the Battle of Britain. He added 15 victories to his victory tally in the aerial battles over England during 1940, including his 10th, a RAF Hurricane fighter shot down near Folkestone on 15 August. On 1 October 1940, Lignitz was appointed Gruppenkommandeur of III./JG 54. Oberleutnant Lignitz was awarded the Ritterkreuz on 5 November for 19 victories. On 6 April 1941, during the Balkans invasion, Lignitz claimed a Yugoslavian Blenheim shot down for his 20th victory. Hauptmann Lignitz led III./JG 54 into the invasion of Russia in June 1941. He added five victories over Russian opponents to raise his victory total to 25 by mid-September. On 30 September 1941, Lignitz engaged Russian I-153 fighters in aerial combat. During the engagement, his Bf 109 F-2 (W.Nr. 9668) suffered a structural failure of the wing and he baled out. He was captured and imprisoned. He was known to have suffered ill health while in captivity and is thought to have died. Lignitz was posthumously promoted to the rank of Major. Arnold Lignitz was credited with 25 victories. He recorded five victories over the Eastern front.